How did our father's day went through? Usually, honeyb gets up first in the morning. Me and my dolly got up together, went downstairs with a "Happy Father's Day" Banner wrote by Anzu with my help of course, then greeted him a "Happy Father's Day" while Anzu was holding the banner. SO funny how she said it. Anzu is really good in repeating whatever I ask her to say. She did it with a funny gesture. We snuggled for awhile then I cooked a delicious breakfast. I sent a lovely text message to my Dad ( I miss him ). We just kind of hung out around the house. Anzu wouldn't sleep for afternoon nap so we went out and drove around, had our drive thru foods when she fell asleep in the car. We headed to the park when she woke up, then a little shopping at the grocery and went home. We celebrated the Father's Day in simple way but fun. I wish I could've done more. It's so nice to get to know my hubby in a whole new way everysince he became a father. Wishing for a good health and stress-free life to him, who is a fabulous daddy to a little girl who loves him a lot. Awww so sweet of you naman, love those heart shaped eggs and pan cakes hehehe.. ano mo ginagawa yan? Awww.. that's very cute. Anzy looks funny in her greeting gesture. Anyway, we celebrated the Father's Day in Palawan. We had a blast 'cos it was also a birthday, wedding anniversary, and father's day celebration rolled into one. Hey.. I missed blogging, so I'm finally back. Thanks for the restoration of internet in my house. Visit me back soon to join my 2nd giveaway. It will be hosted by Pink Magaline. Cheers! That sounds like a wonderful Fathers Day to me. It is nice to just do nothing sometimes. I bet he enjoyed it. It's simple celebration but it's worth remembering. belated happy fathers day for your husband at sa papa mo..
simple but fun, basta ba magkasama kayo... that's a nice way of celebrating father's day. by the way, Little Zoie grabbed your little anzu's cute badge! Yes, your hubby loves Anzu and you so much. He is indeed a wonderful dad. Happy Father's Day to him and your father too. 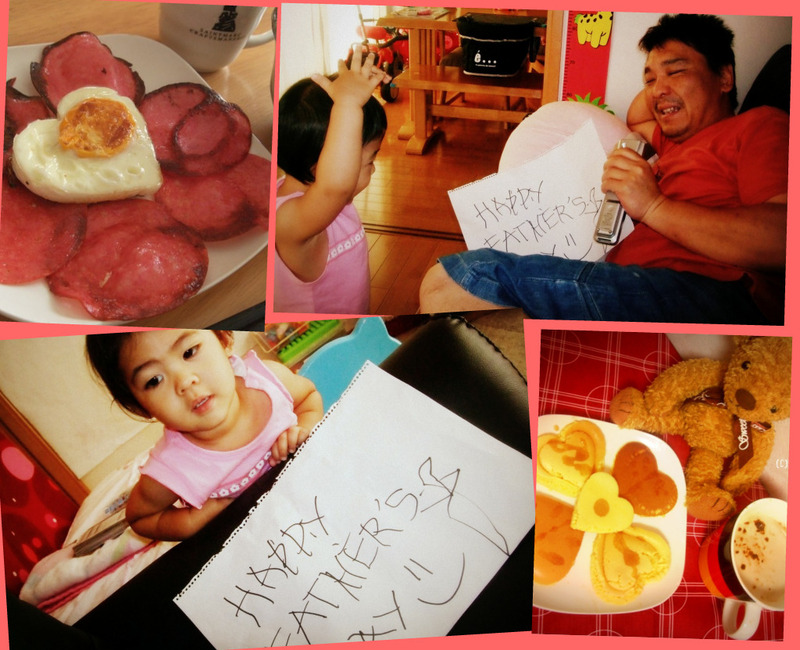 You had a simple yet memorable Father's Day celebration. Your hubby must have been touched by the funny way Anzu greeted him in her own funny and adorable antics. Thanks for the happy post. God bless you all always. you had a laid back celebration but i really think its great.. just to see your family complete is enough! :D happy day indeed! awww.....look at those presentation...my gosh...so yummy...pero nag dadalawang isip akong kainin...lol! I thought nakapag-comment na ako dito(T_T)ito na nga yata ang effect ng lulubog lilitaw sa ere lol! 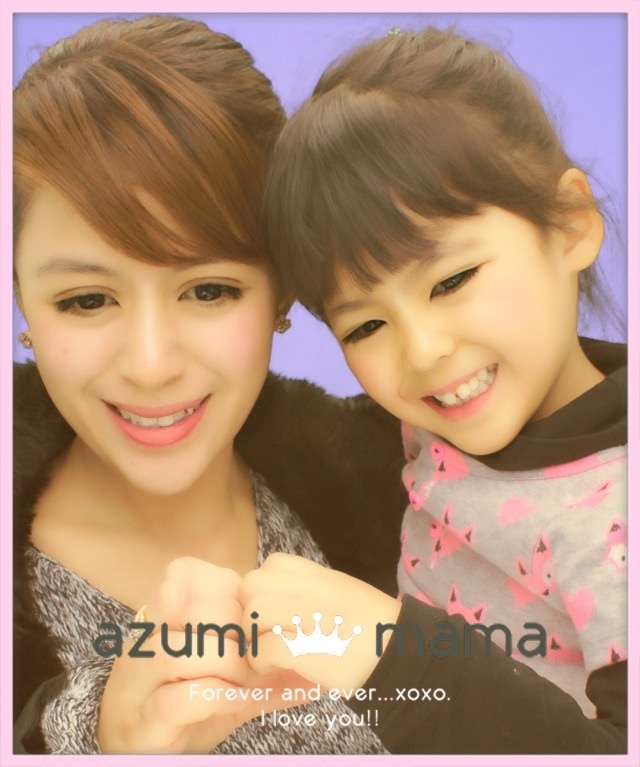 I admire you for being a good mother to Azumi chan and a good wife to your husband.